The SETON HOTEL has just completed an extensive renovation. The hotel staff and management are dedicated to superior customer service consistent with our beautiful new exterior and interior design. We aim to provide our guests with great service and comfort. The courteous front desk staff will attend to your needs and share their city secrets and local favorites- including special discounts and entertainment deal - 24 hours a day. Guests can choose from a variety of rooms- the vast majority of our rooms have new private bathrooms. We also have a unique Economy Option- rooms with a shared bathroom. The rooms are beautiful and share a brand new private bathroom --with 2-3 other rooms--down the hall. 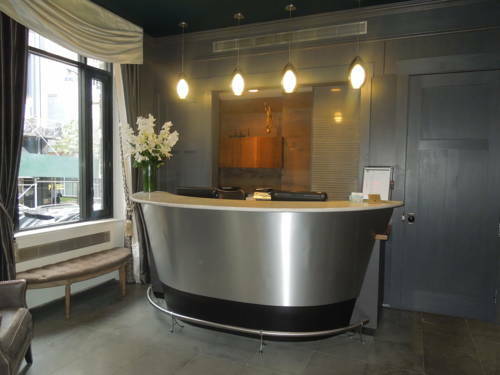 Located at 40th Street and Lexington Avenue- in the very heart of Midtown East- both the business and leisure traveler agree The Seton is an ideal choice. Steps from Grand Central Terminal at 42nd Street- Times Square- the Theatre District- the United Nations- Empire State Building are within easy walking distance. Famous New York Shopping with Macy*s and Fifth Avenue stores nearby. Easy access to subway and major bus lines.